Saving Gas Has Never Been So Much Fun. When you ride the Metropolitan, you achieve an amazing level of fuel efficiency and economy, because this fun and stylish Honda scooter actually gives you up to 100 MPG! The Metropolitan is all about practicality, offering 22 liters of lockable storage capacity beneath the seat, plus a convenient shopping bag holder and a floorboard design to keep your shoes looking nice. 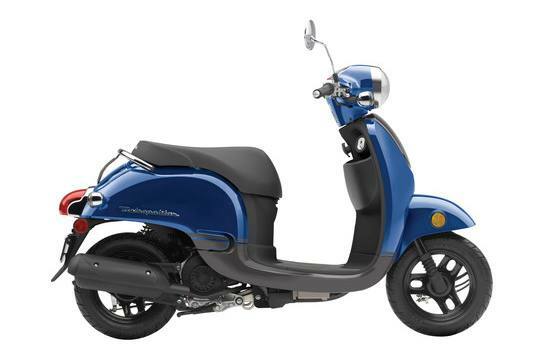 Sensible transportation that puts a smile on your face—that’s the Metropolitan from Honda. The Economy Looks Great: It's sleek, it's chic and it's neat. You get a lot of style for not a lot of money, but you still get legendary Honda reliability. Smarter: Programmed Fuel Injection (PGM-FI) makes the Metropolitan a real winner at the gas pump, returning excellent fuel economy! The technology also helps give the Metropolitan surprisingly good performance. Even More Practical: The Metropolitan is one of the best urban errand-runners ever. A bigger convenience hook holds totes and grocery bags, an inner rack catches your water bottle or other small items and a full 22 liters of secure under-seat storage holds a helmet and more. V-matic Automatic Transmission: The Metropolitan’s one-speed automatic transmission means no shifting ever—not even into park or neutral. Just turn the key, press the starter button and go! Programmed Fuel Injection (PGM-FI): The Metropolitan now features Programmed Fuel Injection. Talk about a win-win: you get more efficient fuel management and crisper performance, especially during start-up on colder days. Handlebar: The handlebar helps make the Metropolitan comfortable to ride. Plus, the Metropolitan’s light weight makes it easy to move when parking. 22-Liter Underseat Storage: The Metropolitan features a large under-seat storage area big enough for a helmet, your books or some groceries. The storage area features a lock for added security and is weather-resistant too. Convenience Hook: A super easy way to hang a tote, grocery bag or purse strap, the hook is even bigger and easier to use this year.